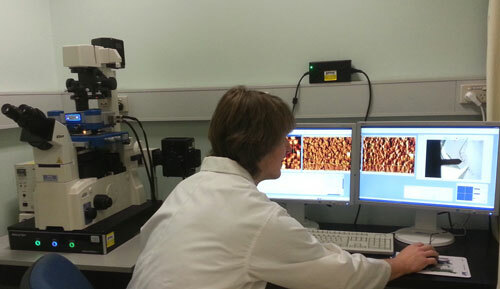 (Nanowerk News) JPK Instruments, a world-leading manufacturer of nanoanalytic instrumentation for research in life sciences and soft matter, reports on the use of the NanoWizard® AFM system in the School of Chemistry at Monash University in Australia. Dr Rico Tabor leads the Soft Materials and Colloids Group in the School of Chemistry at Monash University. Research focuses on several areas. At a fundamental level, the group is interested in exploring the interactions that cause aggregation and assembly, in everything from nanoparticles, droplets and graphene to proteins and cells. This ranges from quite fundamental studies of things like the van der Waals force (of quantum origin) and electrical double-layer interactions, right through to unwinding protein molecules and the forces experienced by emulsion droplets armoured with 2D nanomaterials. In particular, they are exploring ways in which such forces can be exploited, such as whether changing something as simple as pH can cause particles or drops to coalesce or stick together. In other circumstances, more 'advanced' stimuli such as light or magnetic fields are used to induce the chemical or physical effects that are required. JPK Instruments AG is a world-leading manufacturer of nanoanalytic instruments - particularly atomic force microscope (AFM) systems and optical tweezers - for a broad range of applications reaching from soft matter physics to nano-optics, from surface chemistry to cell and molecular biology. From its earliest days applying atomic force microscope (AFM) technology, JPK has recognized the opportunities provided by nanotechnology for transforming life sciences and soft matter research. This focus has driven JPK’s success in uniting the worlds of nanotechnology tools and life science applications by offering cutting-edge technology and unique applications expertise. Headquartered in Berlin and with direct operations in Dresden, Cambridge (UK), Singapore, Tokyo, Shanghai (China) and Paris (France), JPK maintains a global network of distributors and support centers and provides on the spot applications and service support to an ever-growing community of researchers.